Memberships are subject to approval from the zaLUG Executive committee. What would you estimate your average annual spend is on LEGO? Which are your favourite LEGO themes and subthemes? I have read and accepted the terms and conditions and agree to abide by the zaLUG bylaws. Individual information regarding annual LEGO® spent will be kept as confidential information. The total will be calculated for the entire LUG and the information will be one of the submissions used when promoting our LUG to host events on behalf of sponsors. Membership fee is R600.00 per annum or a reduced rate of R500 per annum, payable by EFT in advance. 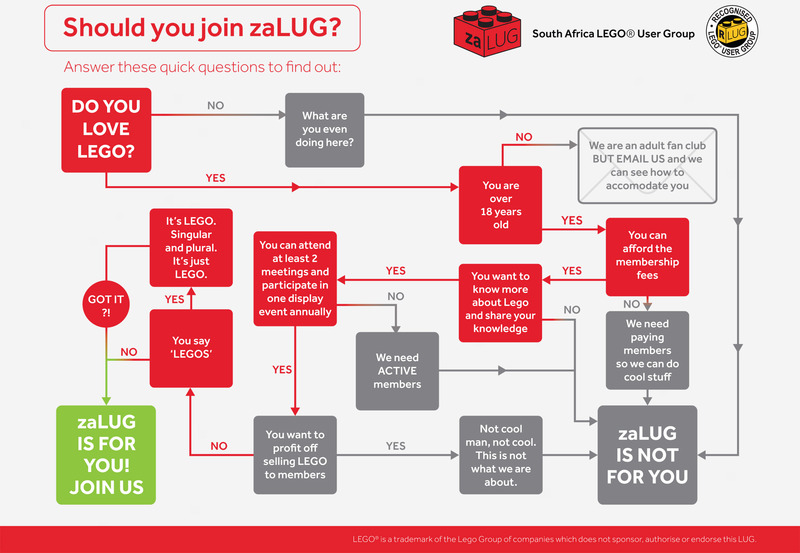 Please email proof of payment to membership@zalug.co.za. When making payments, please use your name and month paying for as your reference. All paid up members will have access to bank statements at LUG meetings. Fees will be used to cover expenses that may include, but not limited to, advertising, branding, website hosting, annual domain renewals, banking costs and other incidentals incurred in the running of the club. Other expenses may include buying of sets as prizes for competitions. Other suggestions for the application of fees will be voted for by Individual Members at LUG meetings. Membership fees are to be paid by members individually. We are committed to keep our operating costs to an absolute minimum to ensure that we are able to give every paying member the maximum amount of benefits possible. Once you have applied, a welcoming email will be sent with the relevant banking details.